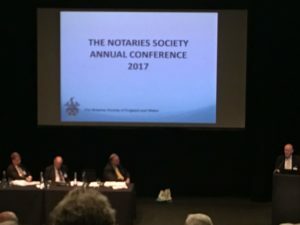 The Annual Notaries Society Conference run by The Notaries Society took place on Thursday 28 September at The Mermaid Theatre in London. 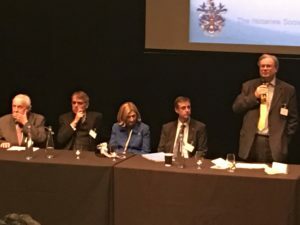 The Conference was a lively event with a full agenda of matters to cover. Top of the agenda was the recent decision of the Lord Chancellor to refuse the ICAEW the right to become a Regulated Body and thereby authorised to regulate Notary Publics in England and Wales. For further details of this decision please follow this link. There was also much discussion about steps being taken by the industry and elsewhere to ensure compliance with the CMA Legal Market Study into the Legal Services Industry. In particular, the recently released Faculty Office Action Plan and the impact this will have on Notary Publics working in London and across the UK. Much of the focus for notaries is now on implementing the Legal Services Board and Faculty Office requirements for greater transparency for consumers and businesses. This transparency particularly relates to notary services and notary fees. For further information about findmyNotary and to view our London Notary Information please follow this link.